How long will I have use of the event space? You get the venue from 10am to midnight. There are no other events scheduled on the same day as your wedding, so the day is completely yours. This also gives you plenty of time to get your hair and make-up done on site, set-up your ballroom or do a rehearsal. At the date of booking, 25% of the total venue price is required to be put down and will be applied towards your total balance. The remaining balance is then split into two payments. The first “half” payment is required eight months prior to your date, and the remaining “half” payment is made 30 days prior to your date. All payments are non-refundable, however, you do have the availability to change your date before the eight month mark. Do you include a wedding coordinator? Because not all brides need a wedding coordinator, we do not add the cost into our rental price. Instead, we offer a separate coordinator package for brides who do not want to be completely hands on. 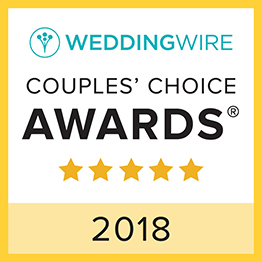 We have received countless reviews on The Knot and Wedding Wire based on what we do for our brides and grooms coordinating wise! Do we have to use specific caterers or vendors? No, you may choose any caterer you’d like! In fact, you can bring in all of your own vendors. The only vendor we ask that you use off of our list is the bartender, and we do offer different options for that. If you decide to go with one of our Recommended Caterers, you also have the option to use their bar service as well. We have a beautiful ceremony site on three acres of formal, sculptured gardens. Our brides and grooms say “I Do” on the steps of our elegantly styled gazebo. It is no extra charge to do your ceremony on site! We allow our brides and grooms to move the ceremony site inside the ballroom, where we create a beautiful walkway for the procession. It only takes your event facilitator about 15 minutes to flip the ballroom back into reception style. Is the ceremony site handicap accessible? All of the event space is handicap accessible. The ceremony site is right next to the ballroom where the reception is held, and the courtyard where we hold cocktail hour is right next to the ballroom, so it is also easily accessible. The restrooms are on the other side of the ballroom. They are handicap accessible and can be easily reached. What is included in the total venue price? We include all of your necessities. For the ceremony, we include all of your white, padded garden chairs, and a sound system with microphone. As far as reception goes, we include the bride & groom’s preferred table, the round reception tables, the mahogany chiavari reception chairs, gift table, sign-in table, cake table, bar table and buffet tables.